Swanton Rotary Speech Contestants were, from left, junior Olivia Bergman, sophomore Benjamin Humphrey, sophomore Grace Butler, sophomore Madilyn Williams, and sophomore Brier Cook. Swanton High School sophomore Grace Butler will represent Swanton Rotary at the District 6600 Four-Way Test Speech Contest in Van Wert, Ohio on April 13. Butler won first place at the Rotary’s local contest on March 7 which qualified her for the district competition. 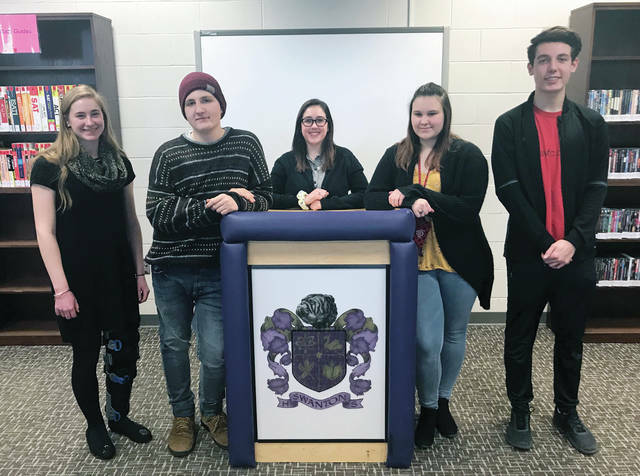 The preliminary contest, sponsored by Swanton Rotary, was held at Swanton High School and encouraged participants to create and deliver speeches by taking a topic of their choosing and applying it to the Rotary’s Four-Way Test. Adopted in 1943 by Rotary International, The Four-Way Test is a set of guidelines by which Rotary clubs around the world conduct community outreach and personal conduct. The test includes simple, yet powerful, questions of: (1) Is it the truth; (2) Is it fair to all concerned; (3) Will it build goodwill and better friendships; and (4) Will it be beneficial to all concerned? Local judges, School Board Member Steve Brehmer, Village Councilman Mike Rochelle and Village Administrator Rosanna Hoelzle critiqued the contestants on delivery, originality and content. Junior Olivia Bergman received second place and Sophomore Maddie Williams took third.